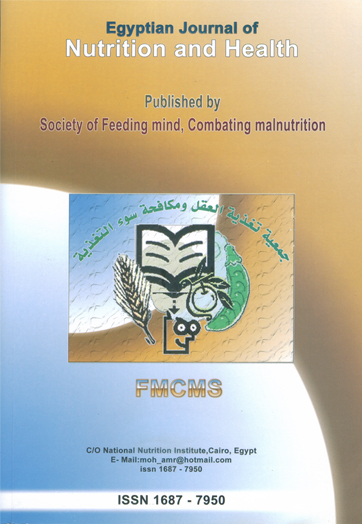 The present work was undertaken to study the effect of feeding 3 herbs viz. : Ambrosia maritima (Damsissa), Aloe vera (Sabbar) and Lactuca virosa (Lebbien), alone and in combination, on body weight, blood glucose and insulin levels in normal and alloxan - diabetic rats. The obtained results revealed that feeding normal and diabetic rats on diets supplemented with Ambrosia maritima or Aloe vera or Lactuca virosa or a mixture of them did not affect body weight at end of the study period. Diets containing Ambrosia maritima or Aloe vera or Lactuca virosa at 10 % concentration significantly decreased blood glucose levels in normal and diabetic rats. Feeding diets supplemented with Ambrosia maritima or Aloe vera at 10 % concentration caused significant increases in serum insulin levels in diabetic rats, while the diet containing Lactuca virosa at 10 % concentration did not. Diet mixed with the 3 tested herbs at 5 % concentration when fed for 3 weeks to both normal and diabetic rats caused significant decreases in blood glucose and increases in serum insulin levels at end of the study period. In conclusion, feeding normal and diabetic rats on diets supplemented with a mixture consisting of Ambrosia maritima, Aloe vera and Lactuca virosa at 5 % concentration for 3 weeks produced significant hypoglycemic and hyperinsulinemic effects, but did not affect body weight. Therefore, daily intake of mixture of these herbs for 3 weeks may be useful in the management of type 2 diabetes mellitus.